Pearl Street Passage opens on October 8, 2015 and runs between 11th and 12th Street in Callowhill neighborhood of Philadelphia. 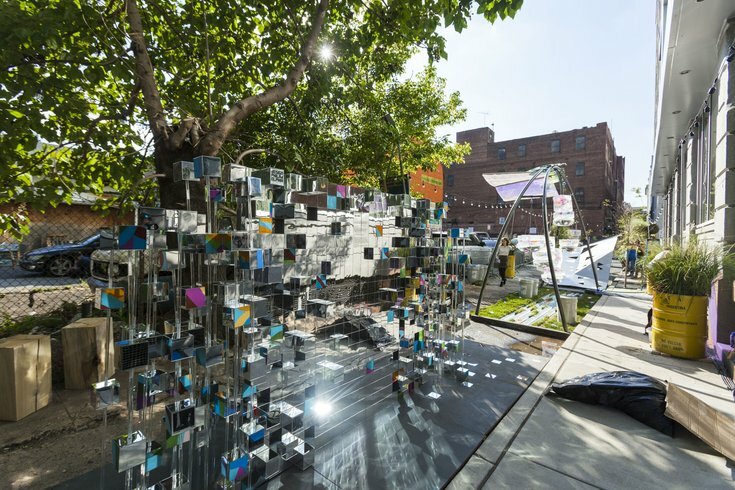 When DesignPhiladelphia opens today and guests amble down Pearl Street Passage, a 10-part outdoor art installation, they'll be alternately amazed, perplexed and inspired. For the festival's keystone event, 10 teams of designers, architects, fabricators, artists and more came together to fill Pearl Street at 11th Street, a narrow avenue just north of Chinatown, with lights, sculpture and greenery. Each team, ranging from three to 15 people, was given its own slice of the passage to transform. 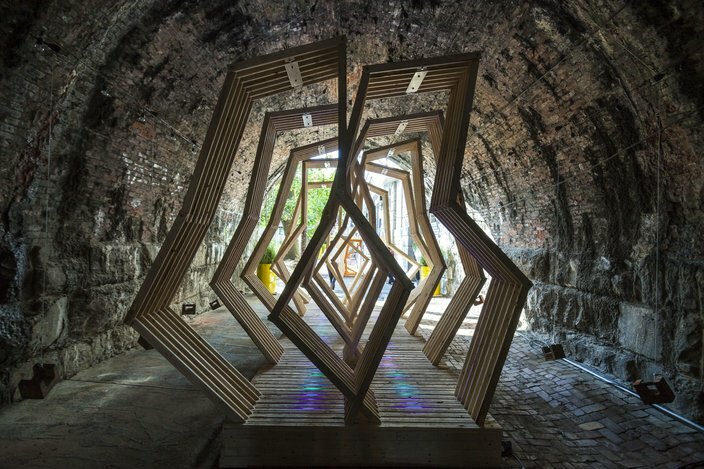 With DesignPhiladelphia's "SHIFT" theme as a guiding light, the teams' resulting installations range from a tunnel of plant life to a live performance space. As a whole, the event serves to awaken passersby to the possibilities of a space, much like the Pope's visit awakened Philadelphians to the possibilities of using the streets as a public plaza. Most of the installations have an interactive element, meant to get the public involved with not only art and design but with Pearl Street itself. "Frames," created by Scout Ltd. and the Challenge Program, was built specifically to give visitors a new view on the space. It's comprised of different chairs that position the user in front of canvas frames. Each canvas frame creates unique compositions, putting the focus on plant life, the buildings along Pearl or the sidewalk. "Selfless," created by a team of professionals from Gensler and Postgreen Homes & Hybrid Construction, artist Serena Saunders and student Richard Vilabrera Jr., similarly discusses viewpoints. 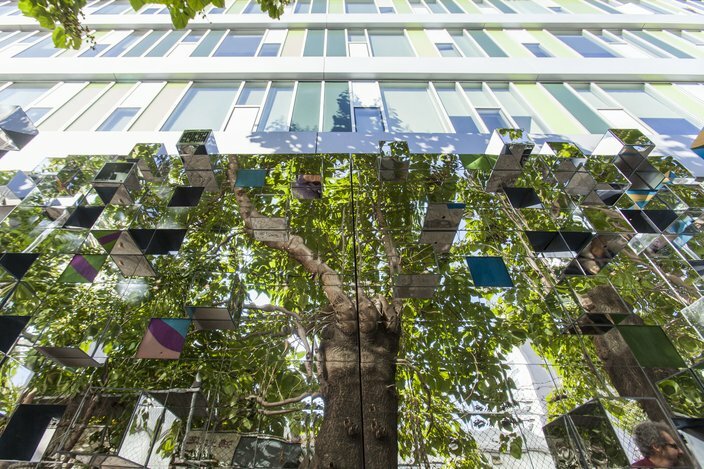 Made up of glass cubes and mirrors, the installation encourages passersby to snap a selfie in its reflective surface. As they move past the work, they'll see their image refracted, disrupted and merged back into real life, encouraging them to look past their phone's camera lens. Perhaps the most strangely named installation, "James' Fear No Kitchen Swell" is also one of the most optimistic. It's comprised of large blocks of ice suspended in the air, dripping onto the ground below. Frozen in those blocks, however, are bags full of wildflower seeds indigenous to the area. Visitors can grab a bag of "seed bombs" as they melt out of the sculpture and plant them wherever they like. 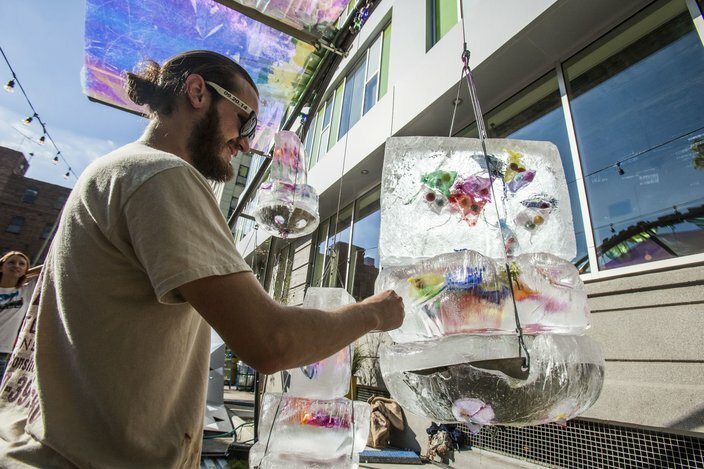 Its creators, Groundswell Design Group, FK Productions, ice sculptor Peter Slavin and landscape architect James Bonney, created it to help make Philly a greener place. "The goal is to share the idea that to manifest change, you have to participate in it," said Groundswell's Laura Rennekamp. "Emoji Gate," created by Sikora Wells Appel's Amy Syverson, Keith Hartwig of KRH Design and artist/mechanical engineer Carter Smith, is sure to bring a smile to guests' faces. Mimicking the arch of the Reading Viaduct overhead, the gate looks like a great, glowing translucent rock formation. 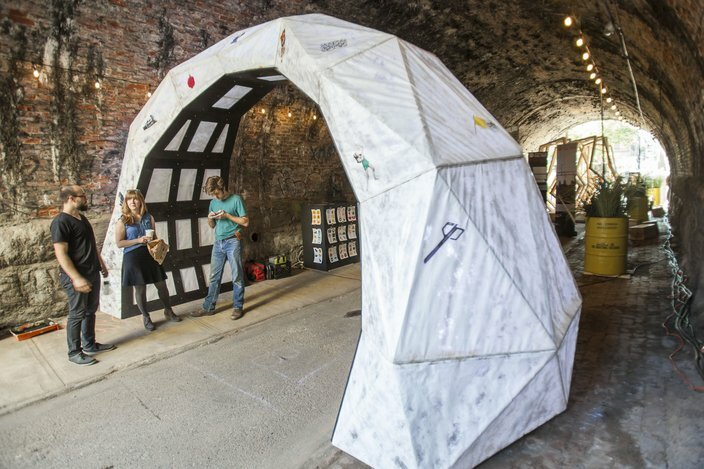 But soon it will be covered in emoji's, printed from visitors' social media accounts onto stickers that can be plastered all over the arch's surface. It represents how society has turned tangible things into intangible things like emoji symbols, and turns them back into tangible items again, to be played with and manipulated. 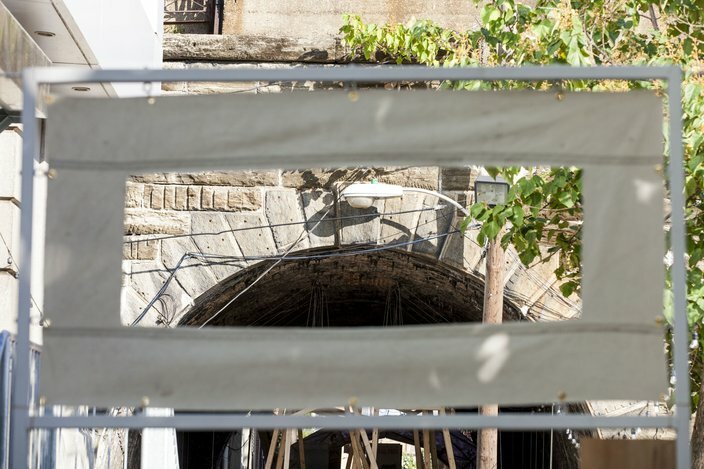 The experience of Pearl Street Passage is exciting not only for those strolling through but for the many designers, architects and artists involved in the project. To see the work of so many Philadelphia makers in one space is inspiring on its own. "This has been really a great experience for all of us to be able to not only work with more designers on programming but also to engage with the community and stakeholders here in this place," said Rebecca Johnson, executive director of Philadelphia Center for Architecture and AIA Philadelphia. When considered individually or as a whole, the installations down Pearl serve as a conversation piece, encouraging discussions on public space. The project is sure to shift viewers' expectations for places like streets and alleys by opening their eyes to their many uses. As public art continues to sprawl all over the city, events like this make it hard to deny the changing attitudes Philadelphians have towards its public space. Pearl Street Passage is open 10 a.m.-10 p.m. Oct. 8-10 and 10 a.m.-5 p.m. Oct. 11.